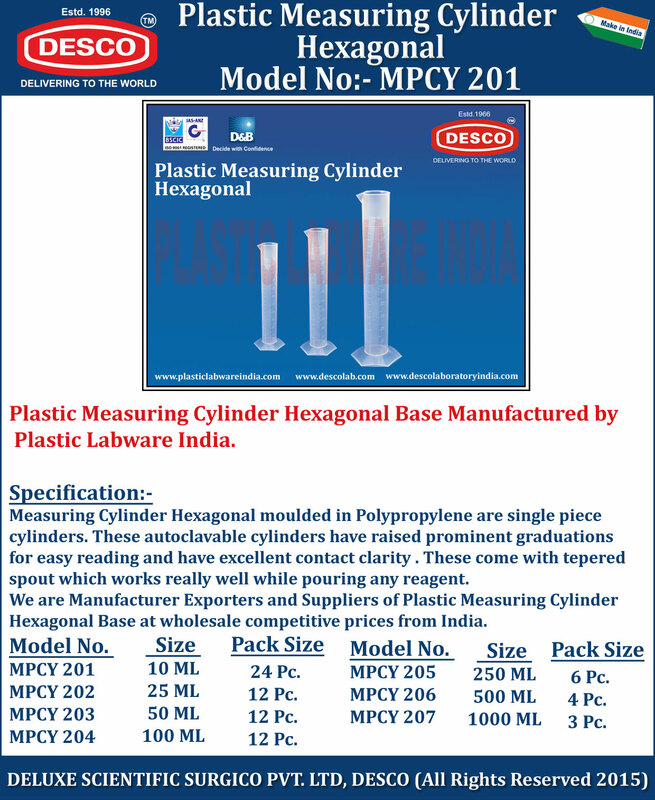 Measuring Cylinder Hexagonal moulded in Polypropylene are single piece cylinders. These autoclavable cylinders have raised prominent graduations for easy reading and have excellent contact clarity . These come with tepered spout which works really well while pouring any reagent. We are Manufacturer Exporters and Suppliers of Plastic Measuring Cylinder Hexagonal Base at wholesale competitive prices from India. MPCY 201 10 ML 24 Pc. MPCY 202 25 ML 12 Pc. MPCY 203 50 ML 12 Pc. MPCY 204 100 ML 12 Pc. MPCY 205 250 ML 6 Pc. MPCY 206 500 ML 4 Pc. MPCY 207 1000 ML 3 Pc.